Crest is a brand of toothpaste made by Procter & Gamble in Germany and in United States of America and sold worldwide. In many countries in Europe, such as Germany, Bulgaria, Serbia, Ukraine, Russia, Poland, Hungary and Romania, it is sold as Blend-A-Med, the name of an established German toothpaste acquired by P&G in 1987 (formerly Blendax GmbH, located in Mainz, Germany). While toothpastes containing a fluoride as the active ingredient had already a long history Crest was first introduced in the United States in 1955. At first it used stannous fluoride, marketed as “Fluoristan” (this was also the original brand name it was sold under—it was later changed from “Fluoristan” to “Crest with Fluoristan”). The composition of the toothpaste had been developed by Drs. Muhler, Day, and William H. Nebergall at Indiana University, and was patented by Nebergall. Procter & Gamble paid royalties from use of the patent and thus financed a new dental research institute at this university (“The House that Crest built”). The active ingredient of Crest was changed in 1981 to sodium monofluorophosphate, or “Fluoristat”. Today Crest toothpastes use sodium fluoride, or “Dentrifice with Fluoristat”; Crest Pro-Health, recently introduced to the market, uses stannous fluoride again and an abrasive whitener together called “Polyfluorite”. 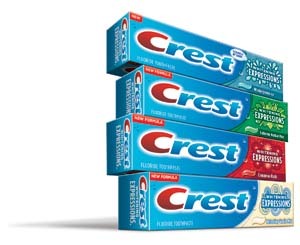 Crest is noted by the American Dental Association (ADA) as an “effective decay-preventive dentifrice that can be of significant value,” as well as by equivalent dental associations in other countries. The Crest brand has also been associated with about twenty brands of dental care products, including toothpaste, toothbrushes, mouthwash, dental floss, as well as a tooth-whitening product called Crest Whitestrips. Examples of toothpastes include Crest Pro Health, Crest 3D White, Crest Tartar Protection, Crest Whitening and Scope flavored toothpaste. From 2004-2010, Crest sold dental floss under the Crest Glide brand, which is now called Oral-B Glide. The original Crest logo was designed by Donald Deskey.